One glaring problem has plagued me as I work my way through writing various OSRIC / 1E adventures. The OSRIC rules do not include Thaco in monster stat blocks. Monsters attack as Fighter of “appropriate levels”, BUT those levels do not equal hit dice or anything in the monster stat block. So you must get the HitDice from the stat block, then go to Attack and Saving Throw Matrix for Monsters to find the matching level, then back to the attack matrix for fighter to find the Thaco. This has been an on-going page flipping hassle. Why OSRIC? Why Stuart Marshall did you not include Thaco (Or a generic similar term)? I know it’s a 1E clone, and 1E didn’t have Thaco either. But we get XP with OSRIC, which was missing in 1E. It’s a small thing, but a page flipper for DMs. I decided to take a break from writing and create for myself a table to rectify this page flipping hassle. 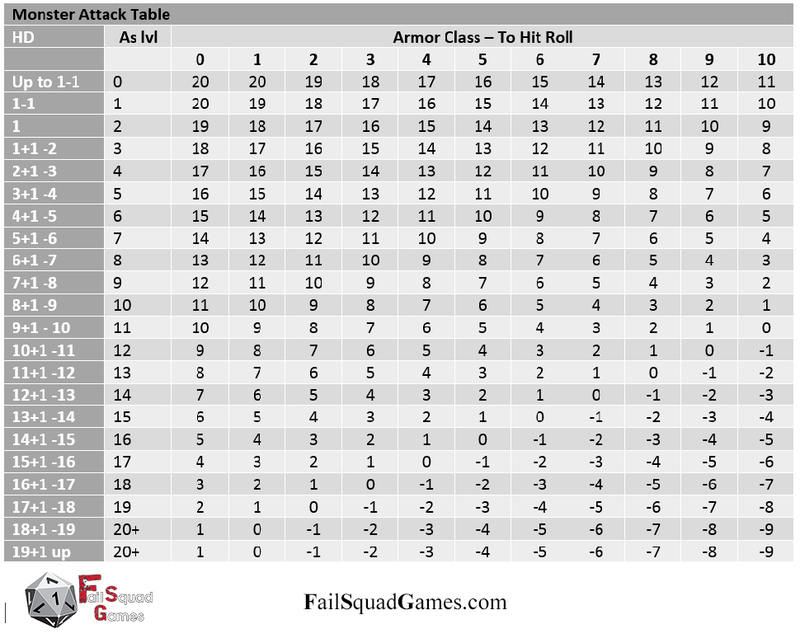 Then it occurred to me that other DMs were having a similar time, so here is the resulting table. If you share it around, just please try to keep the FSG logo and text at the bottom. I would really appreciate that. Click on the image for a full size view. From there you can print, etc. ← Identify – Are you doing it wrong? In all honesty, it’s because I didn’t think of it. Wrong, THAC0 was in the 1st Edition DMG…. It wasn’t in monster stat blocks though in monster manual etc.